According to Bleacher Report’s Howard Beck, Derek Fisher has decided to retire from playing and accept the Knicks’ offer to become their next head coach. After firing Mike Woodson and his staff in April, it appeared as if the Knicks would hire Steve Kerr, a former player of team president Phil Jackson who’d been working as a TV analyst. But when Kerr took the Golden State Warriors coaching job, Jackson set his sights on Fisher, another of his former players. Jackson’s interest in hiring Fisher was no secret. He was fined $25,000 by the NBA earlier this month for tampering after admitting that Fisher (who was under contract with the Thunder) was on his list of candidates. According to ESPN’s Marc Stein, the Knicks’ biggest fear was that Fisher would opt to continue his playing career, thus forcing the team to turn to a Plan C. But according to Beck’s tweet, the Knicks got their man. Fisher, an 18-year veteran who won five championship rings as a Laker under Jackson, was regarded a leader during his playing career — not just on the court, but as president of the players’ union. Jackson was reportedly interested in hiring a young coach whom he could mentor, and Fisher (like Kerr) fits that description. His relationship with Jackson would also allow the Knicks’ president the freedom to have whatever on-the-court role he wants at training camp or practices. According to Beck, Fisher’s coaching staff is likely to include Kurt Rambis, and others “in the mix” include Rick Fox, Luke Walton, and Bill Cartwright. 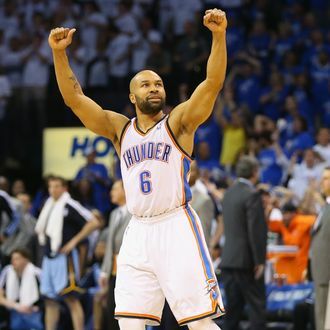 Beck reports that a deal between Fisher and the Knicks isn’t in place yet, but is expected soon. Frank Isola of the Daily News says that no press conference has been announced, but that the Knicks would prefer to do one either tomorrow or Thursday, which are both off days for the Rangers.